Finding people to follow on Snapchat is one of the most difficult parts of using the social and media app. It’s definitely one place that they app can improve on experience-wise. To help you find the best celebrities to follow on Snapchat, we are going to tell you their usernames so you can quickly curate your Snapchat into the most fun, watchable experience possible. Kendall Jenner (@kendalljenner). Following Kendall Jenner is a great choice because, as one of the world’s top models, gives you a peak into what goes on a shoots, shows, and appearances. What makes her Snapchat even more fun is that she often has rappers, actors, and other well-known people pop into her video and picture Snaps. Gigi Hadid (@itsgigihadid). We recommend following Gigi Hadid because her account is full of stunning travel photos, yummy hooking, and offers a unique peak into the private life of the model. Khloe Kardashian (@khloeksnaps). Khloe Kardashian’s account is particularly fun to follow. Her focus is on her fitness and workout sessions. It’s a great Snapchat account to follow for some fit-inspiration. Chrissy Teigen (@chrissyteigen). Chrissy Teigen’s Snapchat is never boring. It features cooking lessons and a fun glimpse into the life of Chrissy. Kim Kardashian (@kimkardashian). No list of celebrities to follow would be complete with Kim Kardashian. When you follow Kim on Snapchat, you get an exclusive look inside of her typical beauty routing, get to see behind-the-scenes at events like the Met Gala, and cute moments with North and Saint. Lady Gaga (@ladygaga). Pop star Lady Gaga is a naturally fun person to follow. Follow Lady Gaga and you’ll get to see fun photos of videos of her puppies Asia and Koji! Kate Hudson (@khudsnaps). So far our list of celebrities to follow on Snapchat has been focused on more glamour and modeling. While Kate Hudson embodies both of those things, she tends to have a little more fun and does things like silly voices. Watching Kate on Snapchat will put a smile on your face daily. Swae Lee (@swaeswaesware). Swae Lee is by far one of the most entertaining Snapchat accounts to watch. His account is amaizng to follow because he often shows his adorable pet monkey playing (or sleeping!). We definitely recommend adding Swae on Snapchat. DJ KHALED (@djkhaled305). DJ Khaled is one of the most legendary Snapchat users of all time. It features DJ Khaled on a jet ski, playing with his son Asahd, or making music. Following DJ Khaled’s account is a must. Rick Ross (@ferrarifatboy). Rick Ross is our second rapper on this list of celebrities to follow on Snapchat. Follow Rick Ross as he explores the country (and eats an unusual amount of Wing Stop chicken!). Paris Hilton (@realparishilton). 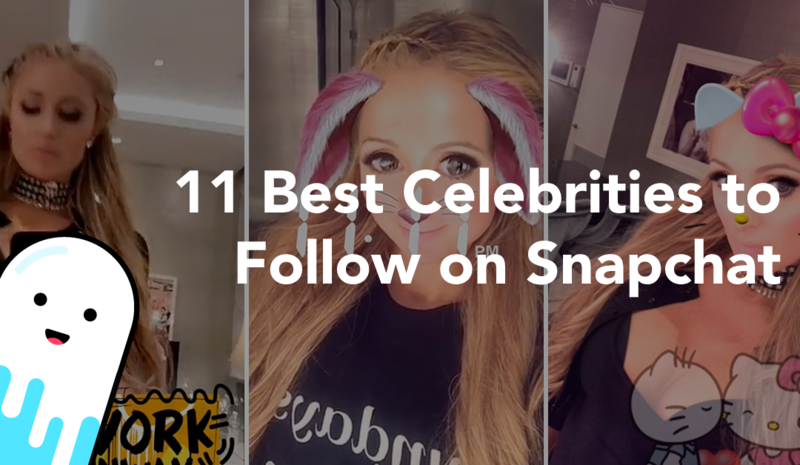 The 11th celebrity to make our list of Snapchat accounts to follow is the original social media star, Paris Hilton. Paris Hilton is the “OG” party girl. When you follow her on Snapchat, you will see her puppies along with her jet set crazy lifestyle. Want to Snapchat like a celebrity? You’ve probably noticed that celebrities ALWAYS have their own custom Snapchat Filters at their events (like birthday parties, weddings, etc.). If you want to make your own custom Snapchat filter like a celebrity, you should click here.